The hospital won for technological achievements including its launch of a clinical data mart designed to monitor the use of anti-microbial medication; its improvements in chronic disease management through alerts and standardized care which led to a 5 percent increase in the number of diabetic patients with HgbA1c under control, and for developing a facility charge calculator within the EMR to more accurately code levels of service based on chart documentation in the emergency department. "It is an honor to be the first two-time winner of the Davies Award, and I am proud of the hard work teams across the medical center put in to make it a reality," Wexner CIO Phyllis Teater said in a statement. Wexner said that the initiatives demanded partnerships across multiple departments in the hospital. HIMSS director of quality and patient Jonathan French applauded Wexner for its "forward-thinking approach to seek new technological solutions to problems around resistant infections, chronic disease management and revenue cycle that have improved efficiencies and care outcomes for patients." The HIMSS Nicholas E. Davies Award of Excellence recognizes organizations that show outstanding achievement in the use of health IT to improve patient outcomes while also achieving return on investment. Established in 1994, the Davies Awards program promotes electronic health record-enabled improvement in patient outcomes by sharing case studies and lessons learned across a wide range of efforts, including implementation strategies, workflow design, best practice development and adherence and patient engagement. HIMSS is also the parent company of Healthcare IT News. The Wexner Medical Center is central Ohio's only academic medical center. It serves all patients and populations, with the uninsured and Medicaid population accounting for about 25 percent of the patient mix. It has a staff of approximately 16,000, with more than 1,500 physicians, 900 fellows/residents and 500 mid-level providers. 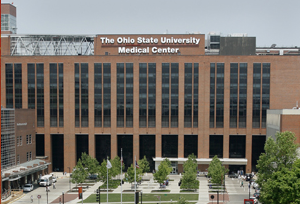 OSU Wexner Medical Center won its first Davies in 2001. The Ohio State University Wexner Medical Center will be recognized at the 2016 HIMSS Conference & Exhibition Feb. 29-March 4 in Las Vegas.